Mama gets lots of requests for recipes for coatings for fried foods like zucchini chicken, mozzarella cheese, and etc. Everyone enjoys fried food, and once and a while we say why not? Of course, we are not saying indulge everyday, but on occasionally, or on special days it is okay to enjoy a delicious fried food. Both of Mama’s All-Purpose Gluten Free Flours, Mama’s Almond Blend and Mama’s Coconut Blend work great for coating fried foods. 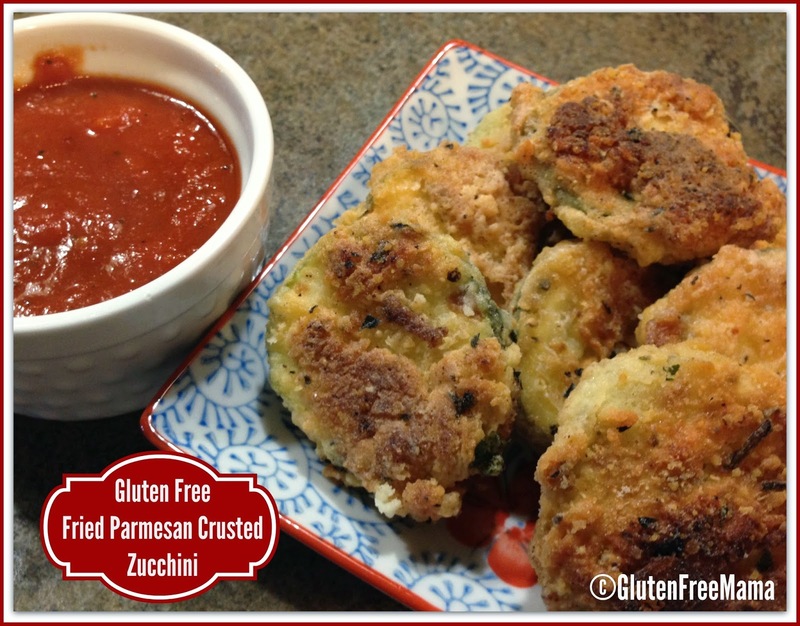 Enjoy Mama’s Gluten Free Fried Parmesan Crusted Zucchini as an appetizer at your next dinner party, or as a side dish for dinner. It is delicious served with spaghetti or lasagna and don’t forget the marinara to dip it in! Slice zucchini into ¼ inch slices. In a small bowl, combine flour, Parmesan cheese, salt, pepper, garlic powder and Italian seasoning. Pour a thin layer of oil into a frying pan. About ⅛-¼ inch thick. Heat over medium heat until hot. Place coated zucchini in hot oil and fry on each side until golden brown. Watch the heat and turn up or down as needed so the zucchini doesn’t cook too fast or burn. Transfer to a paper towel lined plate and until all zucchini is fried. Place fried zucchini on serving plate and serve with marinara sauce. GFM Tip ~ Make fresh Italian seasoning by finely chopping a mixture of basil, rosemary, thyme and oregano. Store in ziploc in freezer and use when needed. 2 Tbsp. fresh is equal to 1 Tbsp. dried. Marinara sauce can be bought in a jar for convenience at your local grocer. Choose a gourmet brand for better flavor. Or if you have time, make a batch of Mama’s Semi-Homemade Spaghetti Sauce. To purchase Gluten Free Mama Flours, click here. I love to hear from my followers! Leave a comment below, ask a question or tell me how you liked my recipe. Hello! For someone just starting out, what would be a good flour blend to use as an all purpose in baking, breading and gravy? Would need to be gluten and sugar free. Thank you! Tastes delicious! I dipped it in egg, flour, egg, flour, and then ended with egg. Putting the egg on last holds the flour on better. When I tried it with putting the flour coating last, lots of flour ended up in the pan and burned.